Consumers have a strong inclination toward shopping across channels: The vast majority (82%) say that they’ve researched and reviewed products online before making a purchase in-store, according to a study by BRP. Additionally, 56% say that they’ve shopped in-store to check out products and then made their purchase online via desktop or mobile device. 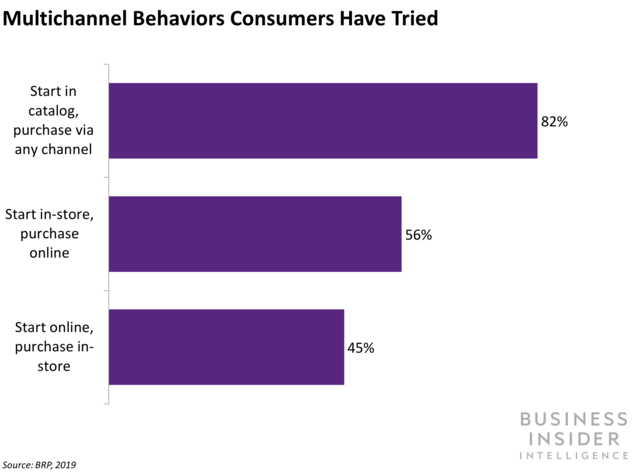 These “start anywhere and finish anywhere” behaviors help explain why a staggering 87% of customers say they want a personalized and consistent experience across all shopping channels. Consumers favor a high degree of retailer transparency and synergy across devices. Fifty-six percent of customers indicate that they’re likely to shop at a retailer that provides a shared cart across digital channels (for example, mobile device or desktop) as opposed to with a retailer that doesn’t offer this feature. Additionally, a strong majority of consumers (66%) say that they’d be likely to choose a retailer that provides inventory visibility across digital channels over one that doesn’t. Provide greater emphasis on personalization wherever customers are shopping. Despite the 87% of consumers saying that they want a personalized shopping experience across channels, only 53% of retailers say that personalization of the customer experience is a top priority for them. More retailers should consider taking measures to make their sites feel more personalized. For example, Walmart overhauled subsidiary Jet.com to show imagery and messages on the home page that correspond to a shopper’s city across devices. Retailers that lack the resources to invest in handling personalization improvements themselves could also consider working with a personalization vendor like Dynamic Yield. Cosmetics company Kopari took this approach to enable its website to adapt to different factors for each customer, such as what device they’re browsing on and what ad they followed to get there. Enable a shared cart that stays updated across devices. One of the most significant gaps found between customer demand and retailer capability was that, while 56% of customers prefer retailers that offer a shared cart across channels, only 7% of retailers actually offer one. If retailers can find a way to offer this feature, it would enable customers to add an item they see in-store to their cart in a mobile app and purchase it later from desktop, for example, providing a more seamless shopping experience regardless of channel.